Monday November 16th 1896 It was a fine warm day. I swept and gave the house a good going over. Will helped we wash in the afternoon. I churned and did scrubbing. I read in the evening. Will took load to valley. Tuesday November 17th 1896 I did ironing and baking this forenoon. Will took load to the valley. I did mending and sewed on rags. Wednesday November 18th 1896 I baked bread and got early dinner. Will and I were in town in the afternoon. I was at the church awhile and did some shopping for Will. It is turning cooler. Thursday November 19th 1896 I cut more rags in the forenoon. There was a stranger here for dinner looking for a place to work. Will took two loads of corn to the valley today. weather much colder. Friday November 20th 1896 Will to the valley this morning. I dressed a duck besides doing other work. We went to town after dinner. I was at Mrs Degans to the Missionary meeting. weather still cold. It was twelve years today since Charlie & Ida were married. Saturday November 21st 1896 Will to the valley. I was busy with the work had dinner early. Will took "Rowdy" in town in the afternoon. He sold him for one hundred dollars. The boys went to town after supper. 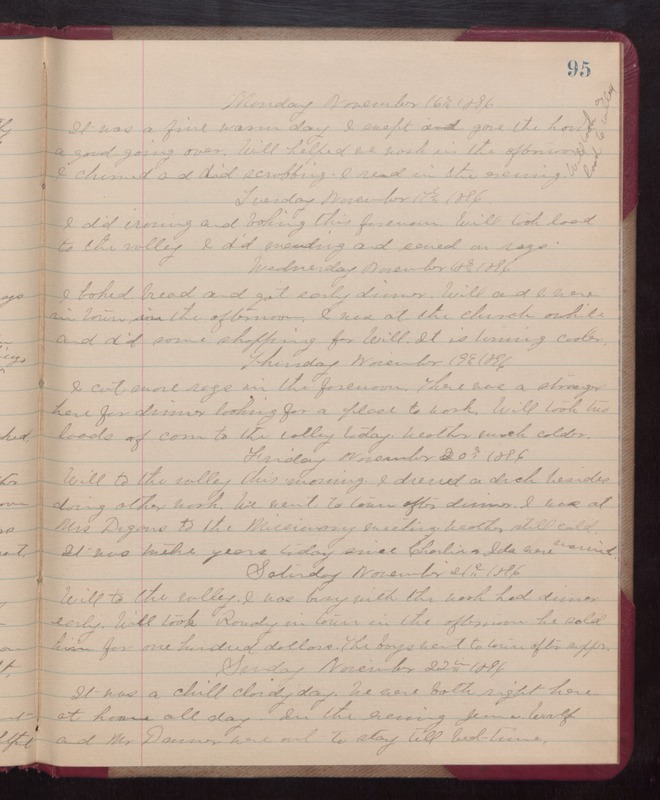 Sunday November 22nd 1896 It was a chill cloudy day. We were both right here at home all day. In the evening Jennie Woolf and Mr Danner out to stay till bed-time.